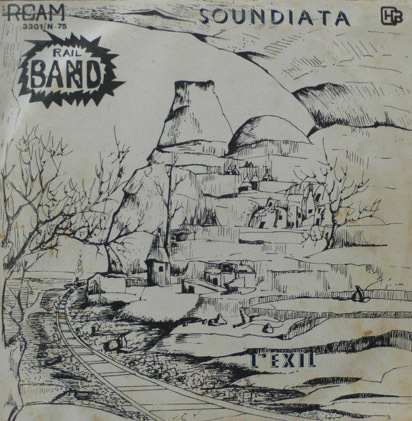 The Rail Band recorded five LPs in Nigeria in 1975, when the group were at their creative peak. The above album was the first release (later re-released with a yellow background) and featured a version of the classic Manding epic of "Soundiata". The Rail Band's version extends over both sides of the LP, and Djelimady Tounkara's lead guitar work throughout is exemplary. This stellar recording was re-released later on Syllart 8357, and also appears on other releases. The RCAM label ("Rail Culture Authentique du Mali", not "RCA Mali", as some discographies list) co-released the Rail Band LPs with the much larger companies of EMI / HMV. As part of a 3 volume series called "La belle epoque" Sterns re-released most of the Rail Band's RCAM recordings. Click here for more details.